SparkFun is putting on a contest to see who can drive around the building the fastest. We've also got a new low-cost gyro breakout and some ding/dent items for sale. SparkFun will be closed December 25th and 26th, as well as January 1st. This means we will not be shipping any orders on those days. On April 15th Spark Fun will be hosting an Autonomous Vehicle party competition. One lap around the Spark Fun building in the shortest amount of time will earn you $300 dollar prize. Check the posting for the rules and to sign-up. Kick the tires and light the fires! 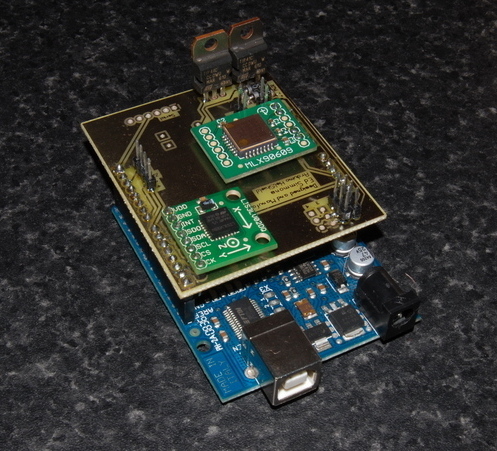 Here is an Arduino based helicopter autopilot using a MLX Gyro Breakout and LIS Accelerometer Breakout. Great work Ed! Remember the Flame Kits from Maker Faire Austin 2008? We are now selling them in all of their beautiful glory. These are great for soldering practice, LED and IR sensor development, as well as perfect fridge magnets. We have some new Ding and Dent items that will interest all of you dumpster divers. We are now practically giving away our production manufactured boards that did not pass our rigorous quality control. Everything from Bluetooth®, sensors, to GPS - all being sold for $5 and under. A new Gyro Breakout Board! The LISY300AL is a low cost, low power single axis gyro with +/-300 degree per second output. We now have a Red LED light Bar, so that you can make your GPS Wall Clock red and preserve your night vision! S-Video cables and RCA cables. You have to have safety pilots in line of sight at all times for autonomous aircraft. For aerial vehicles, you'd be best off doing takeoffs & landings on the roof. Navigating around tightly packed 2 story buildings & trees using GPS could be very challenging. Aerial vehicles above the roof line would have an advantage over ground vehicles. Aerial vehicles below the roof line would probably need machine vision. Happy New Year! I might also buy some of those scrap boards. Happy New Year to you too, from all of us here at SparkFun! Enjoy the scrap boards!